Are sparklers a must for your July 4th cookout? Rather than just tossing the sparkler boxes in a pile on a side table, make them a part of your decor with these free patriotic sparkler holder printables. Combine with Stars & Stripes Printable Kit and Patriotic Medallions to coordinate your party decorations. Download, print, and cut out sparkler holders. Use a craft knife or scissors to cut a slit at the top and bottom of the center design (do not cut all the way to edges.) Weave several sparkers through the slits to hold them in place. Cut slit above and below center design to hold sparklers. These printables will also fit nicely on the front of the sparkler box. Skip cutting the slits and simply glue or tape to the front of the box, then cut off the excess length. Display in a basket or metal bucket for a festive look. Slide sparklers through slits to hold in place. Have little ones attending your cookout? Don’t trust your party guests with open flame? Need to keep track of children and crazy Aunt Mary in the dark? Hand out glow sticks instead of or in addition to sparklers for night time fun. Use glowsticks for younger partygoers. As always, follow the manufacturer’s instructions when using sparklers and other fireworks. Don’t become a Darwin Award winner. Safety first. 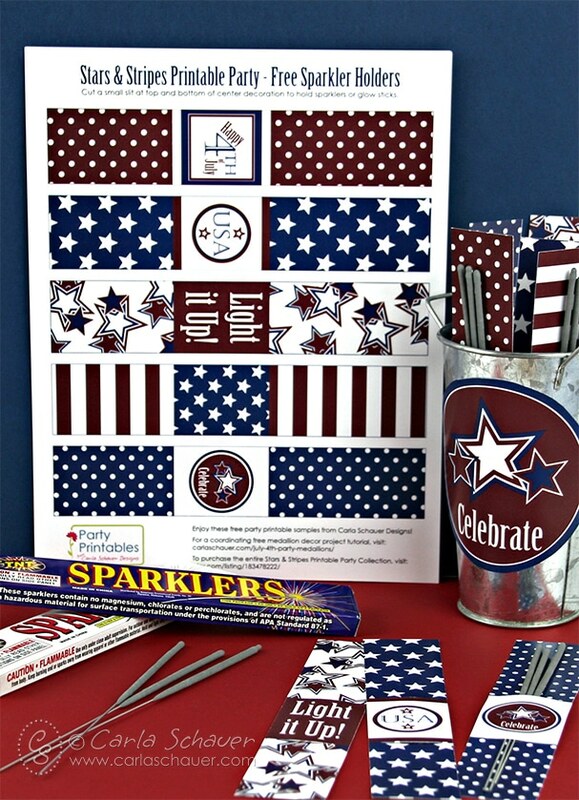 The Deluxe Stars & Stripes printable party kit comes with both 4th of July and non‐holiday specific USA printables. The set includes 14 print‐at‐home files, some of which can be customized by you. See al Stars & Stripes printable party photos. Purchase Stars & Stripes party on Etsy. Includes Free printable 3″ party circles. View the Patriotic Medallion Project tutorial. 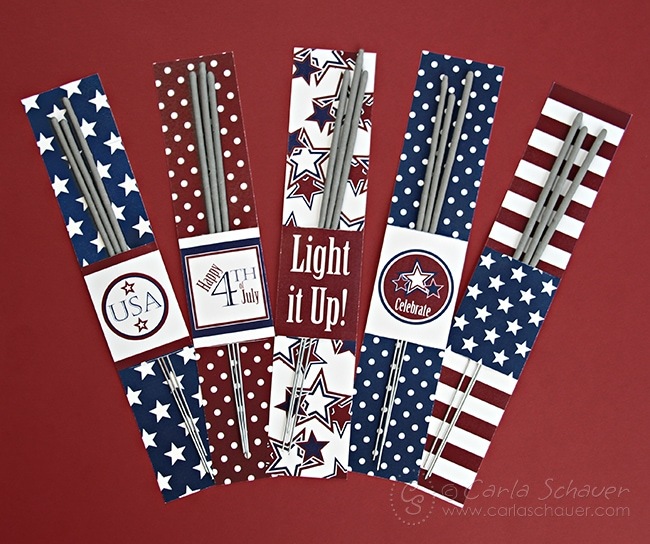 Patriotic medallion project coordinates with Stars & Stripes sparkler holders and Deluxe Printable Party Kit.